If you are just getting started in Salesforce, then you know that often times it may be difficult to determine exactly where you are in the pipeline with a client. The answer to this question is rarely black and white. 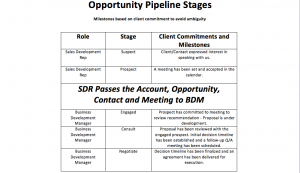 This is where your judgment as a Sales Development Rep comes into play. However, if you’re just getting started, here is a simple way to set up your stage progression that will assist you in determining when and what move you should make next. When using Salesforce, these types of milestones can be a tremendous help in keeping you and your team on the same page. 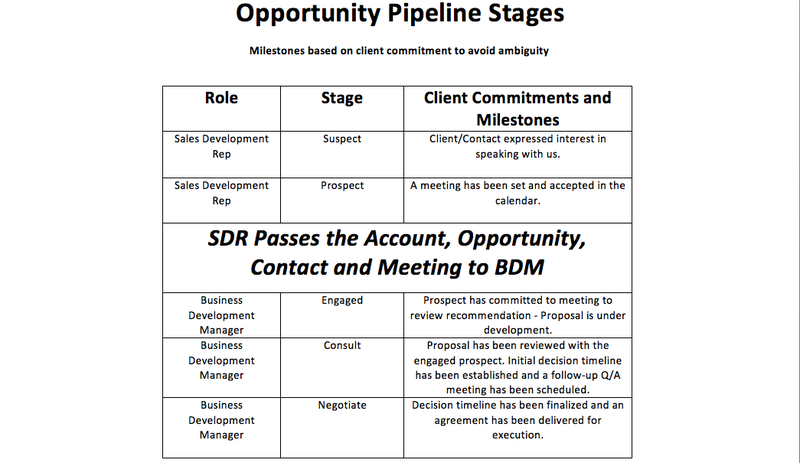 Don’t hesitate to contact us if you have any questions or would like to know how Salesforce pipeline stages apply to your business. Stop searching for the knowledge and have it delivered directly to you. George is a content writer/editor with a keen interest in digital & content marketing as well as sales and marketing alignment. George's current professional passion is strategically curating, creating, and editing valuable content that is a resource for readers. George combines his love and excitement for writing, with his experience in technical optimization to create the most desirable user experience for the audience. As a pupil of Content Marketing he realizes the tremendous role content plays in building a loyal audience and maintaining those relationships over time. George also understands the invaluable impact that those relationships can have on the future profitability of any organization.